J-walk is a multi-level interactive tour of Johannesburg, which incorporates a walking tour, mobile phone tour and online tour of the city. J-walk bridges the gap between the physical and virtual worlds, with the objective of making locally relevant information accessible from a single repository. + Interactive online tour using state of the art mapping tools. For the mobile phone based tour of the city, QR codes will be distributed around town in the locations highlighted by J-walk. 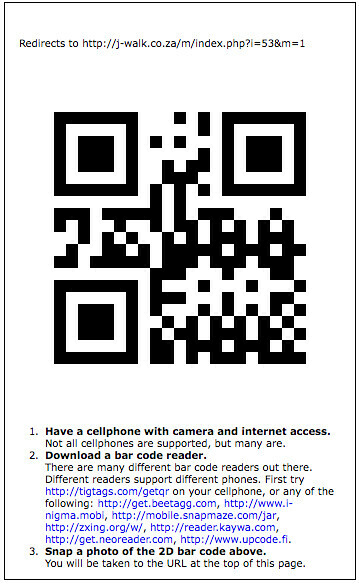 A QR code is a two dimensional bar code. With a small bit of software installed on a cell phone which has a camera and internet access, taking a picture of the QR code will direct the user to a web page with information about the location. You can read more about J-walk on the blog. J-walk will be on show at the Johannesburg Art Fair Special Project – Art for Online Spaces. It’s also listed on a website focused on internet art in the global south (as is Soweto uprisings . com by the way). J-walk was dreamt up by myself, and Ismail Farouk. Update (6 Apr 2015): Discontinued. Update (18 Apr 2010): Delft is now also on j-walk. Next time I’m in town, I’ll guerilla market some 2D barcodes around the city. The j-walk for Delft also replaces the city tour for Delft I created in 2004. Update (16 Aug 2009): You can now use your cellphone to get a guided tour of Chiang Mai, in the north of Thailand. Of course, a web interface is also provided.